Villa Mahi Mahi is a stunning beach front villa, which can be found ontop of the pure white sands of Mullins Beach, in St Peter.Everything about this home is very modern and airy. Villa Mahi Mahi is a stunning beach front villa, which can be found ontop of the pure white sands of Mullins Beach, in St Peter. Everything about this home is very modern and airy, but no more so than the large living room that has double doors opening onto the balcony and, of course, another stunning view of the ocean. If you ever get bored looking out on the great blue sea, the villa offers cable television and a DVD player so you can enjoy movie night. The kitchen is another spacious, modern room with everything you need to prepare a stunning meal complete with local delicacies. There are other useful amenities in the house, such as a security system and a safe to keep everything well protected. The living room opens on to a spacious balcony where guests can dine alfresco whilst, enjoying stunning views of the shimmering sea below. There is also a spacious sundeck equipped with lounge chairs, which is ideal for those who wish to bask in the Caribbean sun. 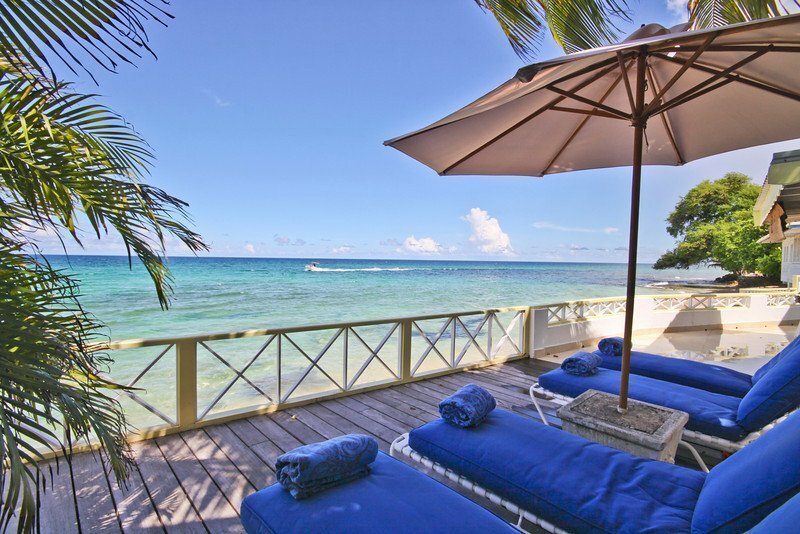 This beachfront villa is kitted out with two air-conditioned bedrooms, both with en-suite bathrooms. The Master bedroom has a double bed and the second bedroom has twin beds, but both share simply gorgeous views of the crystal blue waters that are only a matter of feet away. Villa Mahi Mahi runs directly next to Casa Turquoise and both beachfront villas can be rented together. Please enquire for further details. Villa Mahi Mahi is a magical 2-bedroom beachfront villa. Perhaps enjoy breakfast from the living area, whilst watching the sunrise in the morning or sip on cocktails whilst enjoying the sun set from the decking! Just a plane ride away lies the real fantasy island, Barbados. An island that gives a dreamlike, intimate feeling to your trip. As a Caribbean holiday destination Barbados is a stunning island with a plethora of entertainment, culture and cuisine to make your trip a once in a lifetime experience. Another truly unique quality to this enchanting island is the people. Barbadians, more often referred to as Bajans, are warm and friendly souls, always ready to greet you with a sincere smile. Barbados is guaranteed to make every vacationer feel welcome and accepted, by the time you leave you will feel as you are not only leaving the isle but a part of yourself in Barbados and will want to return again and again.